Set in the beautiful Santa Monica Bay and stretching along miles of white-sandy beaches, Santa Monica is one of Los Angeles' most popular beachside resorts, with a number of notable locations and beach districts. Sitting in close proximity to the equally popular Venice and Malibu beaches, the small beachside community of Santa Monica offers visitors an excellent retreat from the urban jungle of LA and is easy to navigate on foot, with Santa Monica's top attractions centered around the beach. 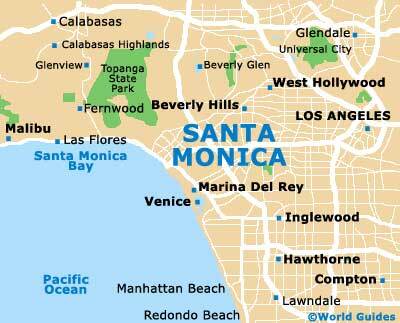 Here are Santa Monica's main districts and locations. 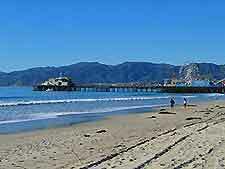 The Pacific Ocean, which washes up on Santa Monica's shores, is one of the primary attractions of Santa Monica Beach. 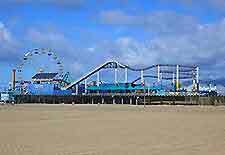 This famous playground is something of a funfair, with Santa Monica's main visitor attractions all located within close proximity to the beach and plenty of opportunities to indulge in water sports. Alternatively, Palisades Park, which lines the Santa Monica coast, provides a quiet retreat from the hustle and bustle of the busy beach area. The renovated pier and surrounding area have become one of Santa Monica's highlights, providing visitors with an alternative activity to the beach. Offering great views of the Pacific coast, the pier is famous for its popular wooden carousel, a restored 1922 ride which is still in operation. It is also here where you will find the Santa Monica Pier Aquarium, situated just below the pier, which offers the chance to get up close with creatures of the deep. 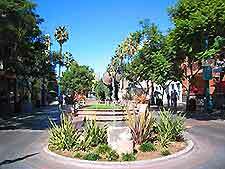 While not a district as such, Third Street Promenade is the heart of Santa Monica's downtown shopping and retail area. The pedestrianized strip offers everything from buskers, street vendors and chain stores to souvenirs, boutiques and one-of-a-kind knick-knacks. This stretch is a must-see for all visitors to Santa Monica and is the ideal place in which to soak up the Santa Monica vibe and get a taste for its lively atmosphere. 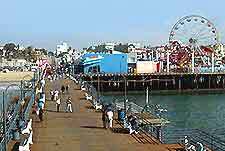 In addition, it is the best place in Santa Monica to come for wining and dining, with excellent eateries lining the promenade.